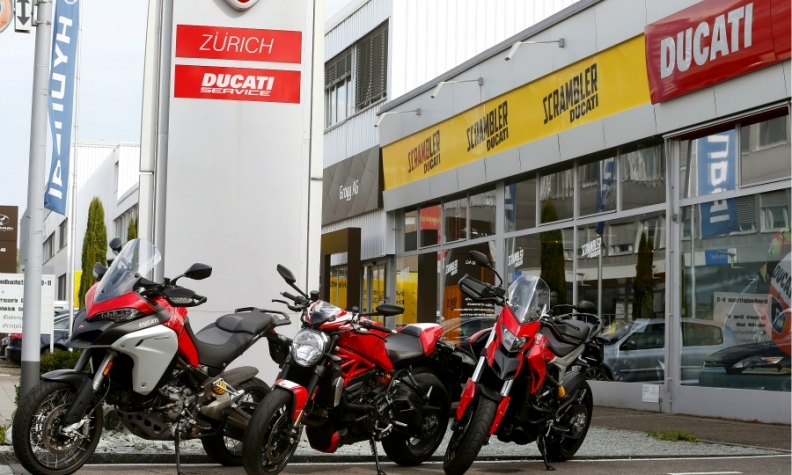 INGOLSTADT, Germany -- Audi has abandoned plans to sell its Italian motorcycle brand, Ducati, in a sign of confidence that the automaker expects to be able to carry the costs of its strategic overhaul following the diesel emissions scandal at parent Volkswagen Group. Steps to reduce costs by 10 billion euros ($11.8 billion), cut red tape and deepen ties with Porsche, a fellow Volkswagen Group brand, are "gradually increasing our financial and organizational leeway for the strategic realignment," CEO Rupert Stadler told reporters. There is therefore no economic need to sell Ducati, Stadler said. VW Group asked banks to evaluate options for Ducati and transmissions maker Renk earlier this year as seeks to become nimbler in its shift towards electric and self-driving cars following its diesel emissions cheating scandal. "I can assure you that Ducati belongs to the Audi family," Stadler said. "Ducati is the perfect implementation of our premium philosophy in the world of motorbikes." The plans had already stalled in the summer when VW's powerful labor unions, backed by the controlling Porsche-Piech families, opposed the logic and need for asset sales given the group's financial resilience. "For Volkswagen's powerful works council, it could be an easy bargaining chip they could offer to push through something completely different," a person close to the matter said. Investors have long favored divestments to simplify VW's group structure and to strengthen its management's ability to push through structural changes against the unions' wishes. "Looking after a premium bouquet is as difficult as the work of a gardener," Stadler said. "Therefore, I am pleased with every new flower, with every promising new branch," he added, predicting Lamborghini's sales would double on the back of its new Urus SUV. To rein in costs, Audi wants to keep headcount stable, at least over the next 2-3 years, even as it plans to have more than 20 electrified vehicles on the market by 2025 and pushes into digitized mobility services, the CEO said. With two-thirds of Audi's 60 or so models by 2025 still slated to be combustion-engine cars, tightening carbon dioxide (CO2) rules will pose the "biggest risk" in coming years, he said, adding that Audi would face 1 billion euros of fines if its average fleet CO2 emissions exceeds EU limits by no more than eleven grams per kilometers. Audi plans early next year to dissolve a task force set up to monitor fixes for 850,000 diesel-fueled cars that the automaker said in July needed updates with emissions-control software to help avoid potential driving bans.